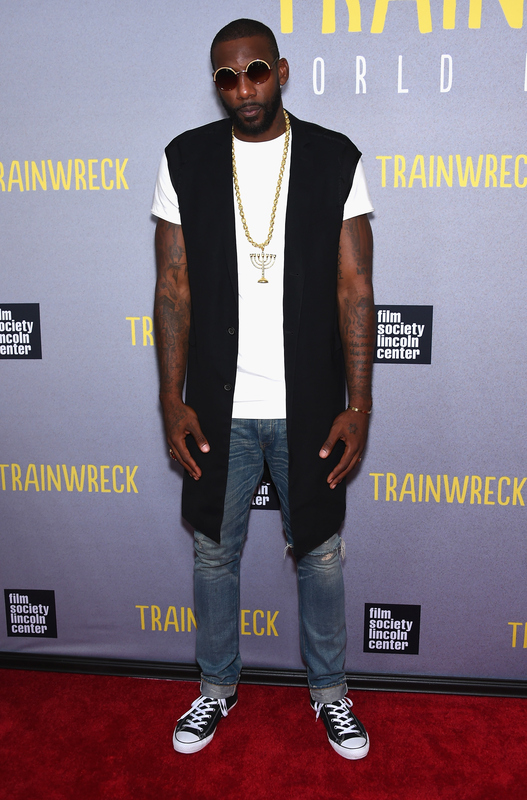 If you've seen the trailer for Trainwreck, you already know that LeBron James appears is in the film. But there's another NBA star who makes an appearance: Amar'e Stoudemire. The athlete has a cameo as himself in the film, which is serendipitously being released one week after Stoudemire signed with the Miami Heat. The player's role is based around Bill Hader, who plays Amy Schumer's doctor love interest, Aaron. In this bit, Amar'e Stoudemire is getting knee surgery, and Aaron is the one performing the procedure. But the athlete is a bit concerned because Aaron looks exhausted, and he's really concerned when the doctor begins to examine the wrong knee. It's a tongue-in-cheek joke, partially because Trainwreck 's Stoudemire has had knee problems in the past, as well as a litany of other sprains, fractures, and more. In a featurette about the filming of one of his several scenes, Stoudemire appears with director Judd Apatow and other movie cast members to talk about his cameo. The basketball player tells the camera, "Today's scene is I'm all decked out in some hospital gear, which I do not like being in." Understandable, since Stoudemire has seen more than his fair share of "hospital gear" over the past ten years, most notably because of none other than knee surgery. In 2005, he had to undergo microfracture surgery for cartilage damage in his right knee. The injury and subsequent recovery period forced him to miss a total of 79 games. Then in 2012, Stoudemire had surgery on his left knee, causing him to miss eight weeks and 30 games. Only a few months later in March 2013, the player had to have a right knee debridement, causing him to miss the rest of the season. Stoudemire's knee issues have continued intermittently since then, posing a verifiable challenge to his ability to perform. In the featurette, Apatow gently acknowledges the threat that an injury poses to an athlete's career. He facetiously say, "I was scared to do a stunt with a professional basketball player because if he breaks his leg, it's probably bad...". But no worries; the filming of the scene was successful! Stoudemire commented to the New York Times on the experience of working with Apatow, saying, "Judd does a great job of making you feel comfortable." Clearly, it worked; Amar'e Stoudemire's acting chops hold up quite well compared to those of the other cast members in the Trainwreck final product. It shouldn't be much of a surprise, anyhow — he has previously appeared in films, such as Beyond the Lights and New Year's Eve, although this is the first time that the athlete is in a primarily comedic scene, with none other than an SNL legend as a co-star. He must've been nervous, but knowing that the surgery his character was about to undergo was totally fake must've helped put him at ease. With Trainwreck behind him, who knows what Stoudemire will do next, but here's hoping it's another big role; the combination of his real-life problems plus his acting talents makes for one enjoyable movie.